Trying to compare Gayle Foreman’s Just One Day and Rick Yancey’s The 5th Wave is more difficult than comparing apples and oranges. It’s like comparing…the perfect macaron in a Parisian café to tinned sardines when you’re starving amidst an alien apocalypse. They are both something you would not want to miss—but they are very, very different things. While Just One Day can certainly be categorized as romance, I would more precisely term it a coming-of-age novel. The 5th Wave is falls squarely in the post-apocalyptic province. Both books are excellent examples of the genre they represent. Since we’re on the second round of the tournament now, plot summaries of Just One Day and The 5th Wave have already been done splendidly by my colleagues. Here I will direct my focus to the merits and weaknesses of each book. The 5th Wave blends the action-oriented quest to survive with the exploration of philosophical theme, “Whom can I trust?” The shifting points of view in this novel highlight the isolation of each character as he or she is faced with the conundrum of distinguishing the good guys from the bad. As humanity faces possible extinction by aliens, the age-old question, “What does it mean to be human?” arises amidst the characters’ attempts to maintain hope, dignity, camaraderie, and love. The fast-paced plot works both for and against this book. The pages turn as secrets reveal themselves and the reader seeks to know who will live and how. However, the abrupt changes in point of view and time frame occasionally disorient the reader, and keeping track of the first four waves of the alien invasion is in itself a challenge! Also, because the extremity of the situation has distilled the protagonists’ lives to the bare essentials, the characterization sometimes feels sparse, lacking the endearing quirks that often enhance the sympathy one feels for the characters. Just One Day, on the other hand, luxuriates in the rich details of setting, and the reader relishes the description of each character–even the obnoxious ones! Readers cheer for protagonist Allyson as she tentatively asserts her own identity against the one her parents have chosen for her and as she gains the confidence to pursue the mystery of what happened to Willem. Forman further explores the theme of self-definition through parallel and foil characters like Melanie, Allyson’s BFF from high school who reinvents herself monthly in college, and Dee, Allyson’s code-switching, out-and-proud, gay African-American study partner. At the close of this novel, the reader feels absolutely compelled to read the companion piece, Just One Year, which tells the same story from the elusive Willem’s perspective. Shall I count it a weakness of Just One Day that the story is not complete in the first book? Or is it Forman’s strength that she manages to show the other side of the coin with equal depth, detail, and pathos in the second book? (I know, I know, that’s cheating…I’m only supposed to review the first book for this comparison!) Still, if I have to pick “Just One Book” to move to the next round of the tournament purely on its own merits, I will pick Just One Day because of the richness of the life into which it draws the reader and the empathy it evokes for the characters, especially Allyson, in her voyage to find her own identity. 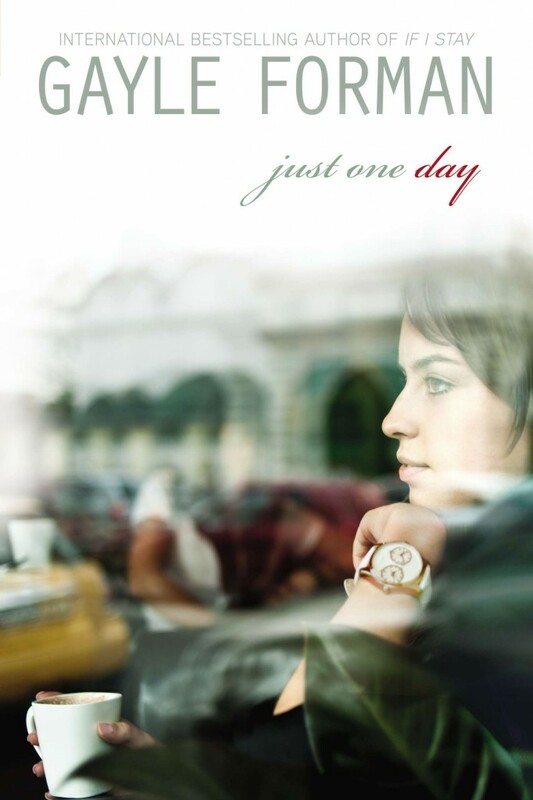 Winner: Just One Day by Gayle Forman. Boxer & Saints were well-crafted graphic novels, detailing the events of the Boxer Rebellion in China from two different perspectives. The choice in topic really made the books stand out because I can’t think of one fictional YA book that focuses on the Boxer Rebellion (not saying that another doesn’t exist). Plus the graphic novel format makes the topic much more approachable and engaging for some teens. Along with detailing the two sides of the rebellions, I really liked the personal development of both of the main characters. Both characters had flaws and difficult decisions to make throughout their journeys and the right answer wasn’t always clear. Added bits of humor throughout the story help lighten some of tougher issues addressed in the book. I enjoyed how Gene Luen Yang connected the two stories together by having characters from each book show up in the other story and sometimes even taking a critical role. Overall, I appreciated the unique views that the two books provided on the Boxer Rebellion and how it deeply divided the Chinese people. While the experiences of the main characters were fantastical at times, both characters had relatable experiences, whether they were the complications of falling in love, family issues or where one’s loyalties lie. The Dream Thieves is the second installment of a planned four book series by Maggie Stiefvater. If you had a chance to read the first book in the series The Raven Boys, you may have wondered how its storyline would spread out over four books especially since the ending (or what seems like the ending) is revealed at the beginning of the first book. The Dream Thieves makes it clear how this complex and interesting story can develop into a series. Maggie Stiefvater impressed me by focusing much of this book on the dark and moody Ronan, which was a shift from the character focus in The Raven Boys. In The Dream Thieves, Ronan learns more about his ability to pull actually things from his dreams and he also starts to piece together secrets from his past. At the same time Adam is still trying to figure out his place in the world. Blue is struggling with her relationship with Adam and her visions of Gansey, and Gansey is still in search of a dead king, Glendower. The story is told through alternating viewpoints, each is well developed. The characters are very deep, and more layers are revealed as you progress through the book, even with secondary characters. Written beautifully with enchanting descriptions of dream worlds and reality The Dream Thieves keeps you transfixed and leaves you gleefully awaiting the next book in the series. After much internal debate, I decided the The Dream Thieves is the winner. The excellent writing and spellbinding story kept me turning the pages to the end. It was one of those books that you’re sad to finish because you know you’ll have to go back to reading just- okay books for a while. It is very clear that the committee that worked on these brackets were spot on in their selection of the best books of 2013. Like others before me, I enter this challenge without a clear idea of which of the books is my favorite. Both are books that were on my radar but I hadn’t yet read so I was able to go into this challenge without any preconceived notions. I had wanted to read Out of the Easy when it came out but when I read the first line of the novel (My mother’s a prostitute.) I knew that I wouldn’t be able to booktalk this novel to the middle schools and that put it on my “to read when I’m not reading for booklists” pile. I’m really glad that this challenge forced this book into my hands. This story takes place in 1950’s New Orleans where 17-year-old Josie Moraine, the daughter of a prostitute, is trying to remove herself from the life that her mom has created. She moved out of her mom’s “house” at 12 and got her own apartment. She works in a bookstore and cleans the Madame’s house for a living. She has aspirations of college and becoming something more than just a girl from the Quarter. Unfortunately, her past and her mother’s bad decisions keep pulling her down. She has to decide if she is going to keep fighting to pull herself up and out. Part Historical Fiction, part Mystery, part romance – this is a very satisfying read. Ruta Sepetys is a wonderful writer and her second novel doesn’t disappoint. Reality Boy is another book that I really wanted to read but was put on the “later” pile. Gerald “The Crapper” Faust is so filled with anger, it overwhelms him. He is in anger management counseling and fights the need to fight every day. All of the anger stems from when he was five and his parents put his family on a reality television “Super Nanny” like show. To show h is disgust for the whole situation, Gerald did what his five-year-old self thought would best get his point across – he pooped on the dining room table. It got such a reaction that he continued to do it to show his displeasure. His five-year-old self never would have imagined that it would be something that he would have to carry around with him forever. He really didn’t think that he would have to face life alone without a his family backing him up. Unfortunately, his mom is distant (at best), his dad is a workaholic, his sister Lisi moved to Scotland and Tasha is so self-consumed that she only makes everything worse. This is a really powerful novel and makes you look at the world of reality TV in a totally different light. As you read it, you are angry for Gerald so it is no surprise that he is so mad himself. As the reader, hope that he can move beyond “The Crapper” and find a support system. That is exactly what a great book is supposed to do; give you a protagonist that you can support and cheer on and hope that they will come out ahead in the end. At first it might seem difficult to compare these two books but at their heart is the same basic concept – teens who are dealing with the really difficult lives as a result of poor decisions made by their parents. The guidance they receive comes outside sources and they are (understandably) hesitant to accept it on any terms but their own. Because they’ve both been fighting their whole lives, they are kind of selfish because there has never been anyone else to look out for them. Both Gerald and Josie find love and support from people outside their family and ultimately it is those people who help them find their true selves and help to propel them forward. I think I have to give this challenge to Out of the Easy by Ruta Sepetys. Only because there were a couple things in Reality Boy that seemed a little incongruous (particularly he talked a lot about made up postal abbreviations and zip codes that didn’t really flow with the rest of the story). Nothing that would keep me from reading or recommending the book – just that I had to choose a winner and that was the only nitpicky thing I can come up with. I highly recommend that you read both books. This story takes place in a world that might be a stretch for some readers; it begins with a main character meeting a guy at a Shakespeare play and deciding to throw all caution to the wind in the name of adventure. No, that’s not the entire plot…that’s just the first day. Allyson Healy lives a life of order and obedience up until that point, complete with a life that’s been mapped out based on a decision she made in middle school. Her parents are loving but controlling, and she never knew she craved freedom from those things until she had the chance to run. The allure of Paris and a beautiful person named Willem draw her temporarily away. After Allyson returns home, she tries to adapt back to her old life sans adventure. Allyson starts college and her relationships in life begin to change while she feels more stuck than ever. Slowly, she begins to figure out that in order to move forward with her life that she’s got to make changes by going backward a bit. Yes, this book sounds as though it’s got lots of room for fluffy teen-angst moments. But, it’s completely the opposite. Forman has crafted a story that will resonate with your teen readers and adults alike. Forman’s writing style makes you overlook any unbelievable parts in the plot. The reader isn’t being told the story of a sad kid; rather, readers are living the doubts, fears and questions that come along with being eighteen, and actually becoming a functioning adult. The reader can feel the new friendships forming and taste the sense of living on the cusp of teenage child and young adult. Forman’s descriptions of Allyson’s European destinations and travels paint a scene that will make you yearn to visit these sites again and again—with or without Willem at your side. For this reader, the story definitely began as one thing and turned out as another—from finding love to learning how to love yourself in the process. You know Elizabeth Wein’s voice from last year’s Printz honor title, Code Name Verity. This book is not a sequel; it is a companion title. The story is told in a similar writing style through Rose’s journal. We’re still experiencing the life of a female ATA pilot in Rose Justice and her compatriots. 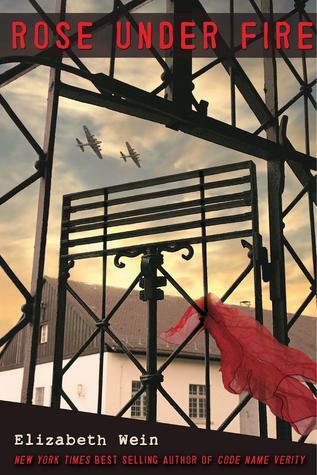 Rose takes some risks result in time as a political prisoner in Ravensbruck concentration camp in Nazi Germany. There, the descriptive nature of Wein’s writing kicks in. Wein definitely has a way with scenery. Akin to Forman, Wein’s writing style creates images that are powerful and meaningful to the reader—it is impossible to be unmoved by the themes in this book. The stories of the individual women that Rose meets while in the concentration camp are the biggest draw for the reader; this diverse group of women (even some who were defined as Rabbits by the Nazis and used as human experiment subjects) provide a face and a personality to those forced to endure such atrocity. While I found value in reading Wein’s title, and I truly believe that this story is a win for fans of historical fiction, I didn’t find myself engrossed in the actual plot. And, I should have been, as Wein had a plethora of elements in her favor. The idea is fascinating, and kudos to Wein on using real historical figures to base her characters upon. The setting is one that, at the mere mention of the word Holocaust, evokes a powerful emotion. Wein had all of the elements of a winner here, but all of them just didn’t mix well for me. The journal writing style is not my favorite to read (I got through it with Verity only because I listened to it on audio). The story was interspersed with Rose’s poetry, too, which added another disruption to the flow. I can say that I was definitely connected to the emotion and the pain of the women (and Rose’s, too) in the story, I don’t know that I ever felt connected to Rose herself. She didn’t express the depth that would have moved me to call this book a complete win. So, I’m calling Forman’s emotional connection the winning element. I think if Wein could have brought this to the table, things might have been different, but for now, I’m travelling with Allyson. As I write this up, I have a confession: Like Brandi before me in her decision regarding Fangirl vs. In the Shadow of Blackbirds, I don’t know which book I will pick yet. I’ve always been someone who has to talk things out before I can come to a decision and until I finish this post, I will be in as much suspense as you are right now reading this – except I can’t scroll down to the last paragraph to peek at the final answer! Enough delay, on to the analysis. I think I will analyze in the order I read these, so let’s begin with Boxers & Saints by Gene Luen Yang with coloring by Lark Pien. I read these for the first time back in October and loved learning about a part of history that I knew next to nothing about (and the little bit I do know is from Buffy the Vampire Slayer, so it doesn’t count, right?). If you can untangle it from the magical realism, Yang has packed a ton of historical detail into both the story and the illustrations. After reading both volumes, I felt I had a fairly clear picture of the causes and course of the rebellion. Yang isn’t just talking history though. Boxers & Saints has a lot to say about faith, loyalty, belonging and compassion. Choosing to make this a duology strengthens every theme Yang explores because we see how those themes thread through both Bao’s and Vibiana’s very different journeys. What struck me the most on this first read through, in fact, were full page spreads that echoed one another in each volume – on pg. 282 of Boxers and pg. 158 of Saints. In each case, that full page spread stops you dead in your tracks. In Boxers, it’s a portrait of “Guan Yin, the Goddess of Compassion – the goddess with one thousand eyes to look for suffering and one thousand hands to relieve it.” In Saints, it’s a portrait of Jesus as he speaks to Vibiana and commands her to “Be mindful of others as I am mindful of you.” Each figure is surrounded by hands that all have an eye in a center of their palm – an image that speaks strongly of compassion – and each portrait is surrounded plotwise by events that lay bare the lack of compassion that war requires. On my second read, I mostly found myself contemplating two things that Karyn Silverman over at Someday My Printz Will Come (http://blogs.slj.com/printzblog/2013/11/25/boxers-saints-or-what-defines-book-anyway/) commented on. One was whether Bao and Vibiana are actually seeing visions of Gods and Saints or if they are simply a little crazy. Are they just trying to find comfort and direction and, without any reliable adults to turn to, creating their own spirit guides from the corners of their minds? I doubt this reading would ever have occurred to me on my own, but, for me, it deepened the themes of faith and belief. The other think Karyn mentioned was Lark Pien’s coloring and on the second time through – the coloring is brilliant. The majority of the panels in both volumes are done in muted, sepia tones. In Boxers there are pops of color for when the Boxers become Gods, blood, and occasional pivotal panels – one of soldiers in uniform, another of Bao backed by fire. Then comes Saints, and the only color pops are the gold that Pien has used for the spirits Vibiana sees – bringing home the contrast these ghostly visits bring to Vibiana’s cramped, narrow, bleak life. But enough about Boxers & Saints. What about Far Far Away by Tom McNeal? I faced a bit of a conundrum when reading this one – I had read so much about it online that I already knew major plot points, most importantly, the identity of the villain, the Finder of Occasions. I was worried this would ruin the suspense of the book for me, but it turned out not to bother me in the slightest. In fact, I loved seeing the clues that had been laid to the Finder’s identity all along – piecing together the puzzle of how the Finder came to terrorize Never Better. I had read a lot about how many weren’t sure this was suitable for under a certain age, and, while the Finder’s methods are certainly disturbing, I was relieved that there was not appreciably gory violence involved. Far Far Away contains elements from two of my favorite genres, mystery and fantasy, so I went into this match expecting it to walk away the easy winner. However, fairy tales form the backbone of this book and, in the end, I think that’s why I didn’t connect with it as much as I had hoped. The characters didn’t feel full except for Jacob Grimm and Jeremy and while that wouldn’t bother me so much in fairy tales, which are constructed around archetypes, in a novel it bothers me much more. The women in particular seem to be either perfect (Ginger, Jenny Applegarth) or terrible (Jeremy’s mother). McNeal has written a great book here, but since I have to pick only one winner, the flat characters knock this one out for me. So, there you go – I’ve talked myself to a winner: Boxers & Saints by Gene Luen Yang for the successful meshing of fantasy and history in service of theme and for that brilliant coloring by Lark Pien. The Coldest Girl in Coldtown by Holly Black and Forgive Me, Leonard Peacock by Matthew Quick are two very dark, compelling novels with extremely different plots. The former is a dystopian thriller and the latter an emotionally intense realistic fiction novel. Holly Black creates a terrifying world in her novel The Coldest Girl in Coldtown where a mother infected by the vampire infection can turn against her own daughter when thirsty for blood. Vampires are both feared and awed, as they are in many traditional vampire stories. Unlike many paranormal novels, this one is chilling and bloody with a unique, steadfast heroine named Tana. The story is wildly imaginative and richly detailed with memorable characters, which creates quite the page-turner. From the other end of the YA spectrum we have a realistic fiction novel, Forgive Me, Leonard Peacock. Matthew Quick writes stories with some unforgettable characters, Leonard Peacock being one of them. He is a loner and an outcast who sees himself as worthless. The entire story takes place in one day, in the tortured mind of a self-loathing, darkly humorous boy on his eighteenth birthday. The story moves quickly, is tense and heartbreaking, yet ultimately hopeful. Quick is a master at using internal dialogue to create a cold and distant character who we eventually see as a troubled, uncertain boy who just needs someone who understands what he is going through. While The Coldest Girl in Coldtown will be a favorite amongst fans of suspenseful, paranormal thrillers, for me, I have to go with the darkly humorous Forgive Me, Leonard Peacock. Leonard’s problems are more relatable and even though he isn’t always proactive and he makes bad decisions, his story will still resonate with readers. The book will make you feel angry, and frustrated, and disturbed, and yet still hopeful. That is the indication of a novel worth reading. Forgive Me, Leonard Peacock is a story that you will keep thinking about long after you’ve finished reading.